To find a piece of work by British artist John Piper on a record sleeve was quite unexpected; to discover it was specially commissioned was even more interesting. Piper, long recognised as a fine artist (whose original work now fetches very good prices), also did a lot of commercial work, with his illustrations appearing on books, adverts and elsewhere (as well as designs for architectural decoration and stained glass). However none of the books I’ve read on his work mention record sleeves. The World Record Club, which had begun life in the mid-50s (and remained) a mail-order only label, used generic sleeves in their early days, but later moved to full colour covers on which they spent a lot of effort to counter the perception of being a budget label. You joined up and got a monthly catalogue to browse (though there was one show store in London). Initially material was classical but they branched out to Easy Listening, Jazz and Pop. Because the records didn’t have to struggle for attention in shop racks, WRC developed a clean style much of their own, with bright photographs and illustrations – some very good, others less so. Once you’ve seen a few, you soon get to recognise the look, and although you only saw them back in the 60s and 70s if you were a WRC member, today a lot ore reaching the second hand market. Titles were generally quite plain in typographic terms. Back covers were always white with black text. The label had their own art director, and much of the cover material was specially commissioned. WRC also operated in America and Australia. The Australian WRC actually set up their own art policy and so most of their sleeves were unique (a book on these is in preparation in Australia and we will review it here as and when). In the mid-70s WRC was purchased by EMI who kept it going for some years. If it’s the covers I generally like, musically the label is also collected. Although quite a lot of material was licensed in, especially in the early days, they did increasingly generate new classical recordings and even some of the pop material was specially cut. I’ve yet to find much out about who was responsible for the UK art direction but might have a word with EMI to see if they kept any paperwork when they took the label on (EMI have their own written archives and album sample collection – I have been down there a couple of times, and fear for what might happen to this if the current private equity funded jerks in charge decide to close it). I cannot date the album here either, which is a recording of the Brandenburg Concertos; the albums carry little information and so far nobody has done much in the way of a catalogue (a case of ploughing through back-issues of Gramophone magazine I guess), but I would imagine circa 1964. 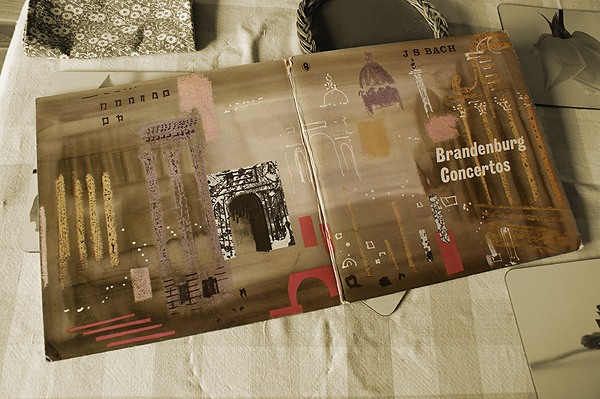 Piper did the work to fit the gatefold format, just slightly oversize (14″ high). It’s a mix of a bodycolour, with collage elements and watercolour. The original artwork – titled Capriccio of Rome – actually came up for sale in 1998 at Christie’s in the UK, but I don’t know what it sold for or where it went. However as even a screenprint by Piper will set you back £2K or so today, this would seem to me as a great way to have something by the artist to display – for just a few pounds. I’ll get some more WRC sleeves scanned as soon as, but here are another three of the illustrated covers to be going on with (and the Annie Get Your Gun cover on our home page header is another).